It is no secret that in today’s world we face distraction as one of the biggest factors to negatively influence our productivity. There is so much modern noise present that makes it difficult to stay in focus. Fortunately, there is a tool that can solve this problem by simply setting it up: the Time Timer. You may be familiar with the situation. You are working on an important task and just lined up your thoughts, you are in focus. The obvious occurs: An awaited mail pops up in your inbox, a push notification lights up your phone, a colleague has sent you a cat riding a robotic vacuum wearing a funny hat video or somebody is just looking for a chat. Every time you get off track it takes time to get back in focus. Sometimes it even leads to postponing the work. The longer you stay away from distraction, the higher your focus and the better the outcome of your activity is. This is no secret. Unfortunately, distraction tears a hole in that efficiency loop. Here comes the Time Timer into play. 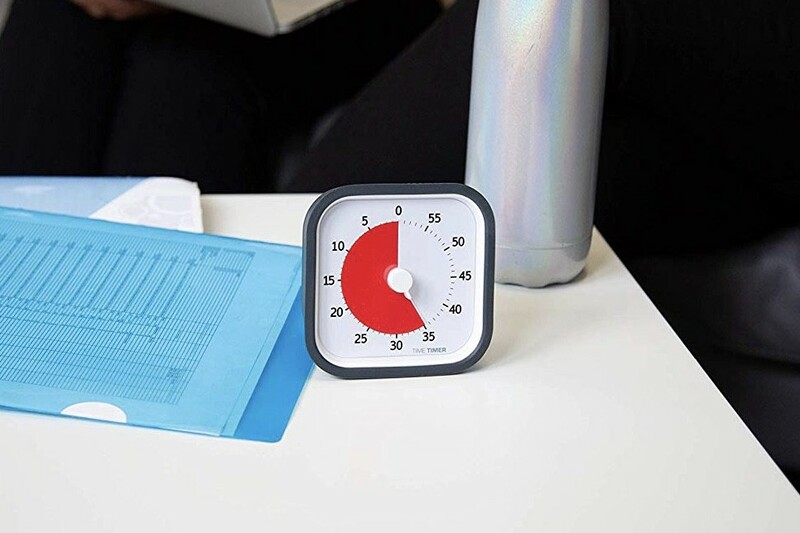 The Time Timer is a normal desk-sized timer, but with one great hack. When set, the red dial indicates how much time is left. When time is passing, the red disappears. The idea is similar to timeboxing: setting up a maximum unit of time for an activity. You are picking a workload and assume how much time you will need or want to spend to get the exercise done. Here the Time Timer creates a visible deadline that puts the user just under the right sense of urgency to avoid distraction. Now you committed to a task. When you get distracted and realize how you just wasted five minutes watching a baby panda munching bamboo, you feel guilty and are less likely to fall into relapse. Also, you can no longer postpone work to a feel-good moment saying, “Let´s wait until 11 o´clock, then I will start. Oh, now it is 11:01? Better wait until 11:15.” With the Time Timer, you can always start now and still get that rewarding feeling starting at the right time. If you are a perfectionist, timeboxing can also help to not overthink it all the time. The tool operates silently with an optional ending alarm which makes it office friendly, puzzled looks from colleagues included. Lastly, the deadline effect helps with the habit of procrastination. But does it work for every task? For me, it has been working for both. I use the timer when I want to burn simple tasks from my to-do list but also when I work on an important project. I even stick to the clock when I am not moving forward on a difficult task rather than taking an inspirational pause to boost my creativity. Yes, breaks are important to get new perspectives. But I learned from experience that I sometimes take a break only to get away from the problem, rather than de-wiring my brain. When I am stuck on a difficult task my brain is powered up. Reinforcing concentration takes time and effort, so I make use of that momentum and see if can solve the problem. If I have not made any progress, I can still take the break afterward. Here you have it: a tool that instantly helps you achieve better results in less time. I hope you find this useful and that it works for you too. If it does not, you can still use the timer in the kitchen getting that pasta on point. You can find the Time Timer here. 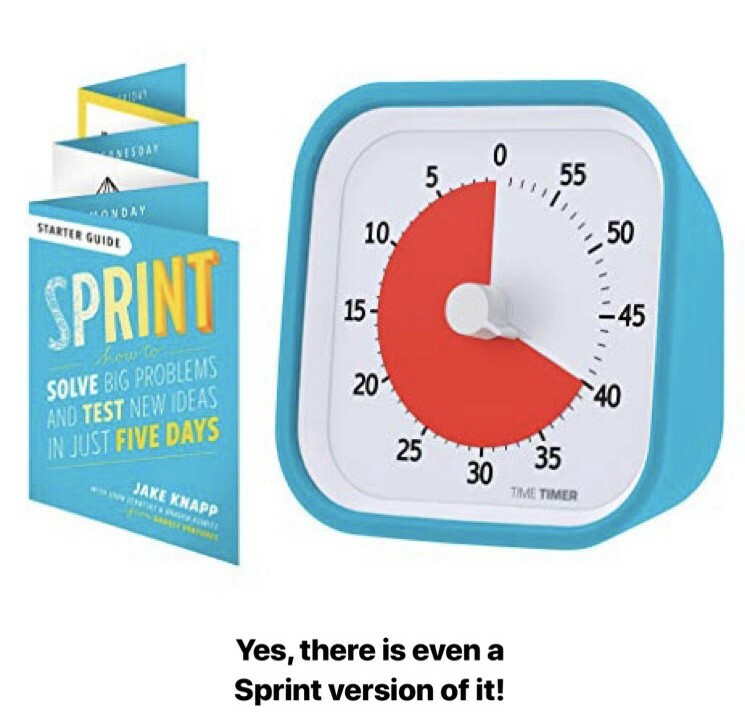 I am a product person and want to find out how to build better products faster.